Nothing too interesting to report about this week. It has been nice feeling more and more familiar with the teachers and kids at the school and getting used to the commute. My classes run the gamut of eagerly interested students to the bad boys in the back row who do not want to participate. Most of the classes have 3o or more students! And I have one class of 16-year-olds with 4 girls and 26 boys!!! I’m having to get back in touch with my middle-school-self to remember what I would find interesting and engaging in the classroom. I really enjoy the work so far- it is challenging and fun at the same time. Today, Julia and I ventured to the wonderful world of Ikea! It involved only a short bus ride from the city center before we arrived at the land of fabulous and cheap Swiss design. Our plan was to stock up on blankets and comforters as winter is slowly creeping in at night here. Inside, the store felt so familiar, that I would be startled when announcements would come on in Spanish instead of English! 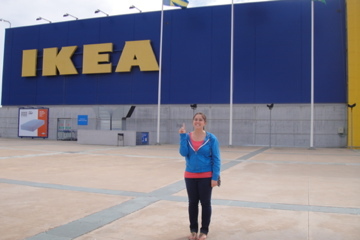 It was Julia’s first time ever to an Ikea! We thought she should get a button, like the kind they hand out at Disneyland for people’s first trip. 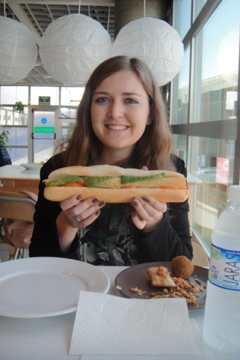 We made sure to stop at the cafeteria for lunch- check out the bocadillo (sandwich) the width of my shoulders for only 2.50 euro! Now we know where the cheap eats can be found! Some experiences feel the same everywhere, such as a shopping trip to Ikea. It was fun to feel a bit of home today! THAT SUMMER IS NEVER GOING TO END !!! !